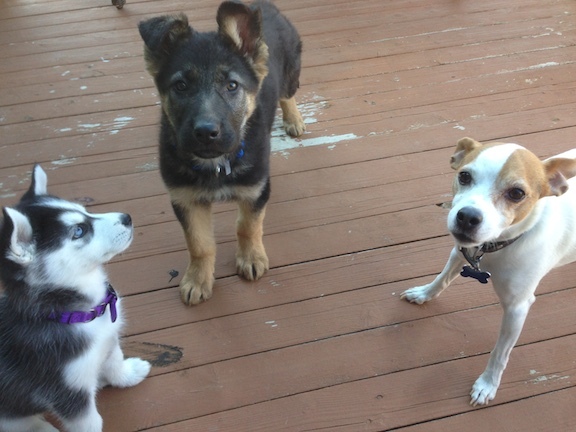 Aurora (far left) is a 7 week old Alaskan Husky who was adopted last week along with Carlos (middle), an 11 week old German Shepherd who was rescued from a bad / neglected situation (Dog was living in a barn, under nourished and filthy). The pups now live with the family’s long time dog Rocky (far right). Their owners called me in for help as the puppies were so excited and high energy that the family and Rocky were a little overwhelmed. As soon as I arrived for the session I could see what they meant. Aurora and Carlos played / wrestled / chased each other non stop for the first 15 minutes of the session as I discussed things with their owners. Because puppies often feed off the energy of other puppies, I had their owners put Aurora and Rocky outside so I could work with Carlos individually. As soon as Carlos was the only dog in the room, his energy dropped considerably making him much easier to work with. I started out with the basics; teaching him to come, sit and lay down. It took about 5 minutes for Carlos to learn each of the three commands. Their owners were amazed at how quickly Carlos was able to learn these commands and had ear to ear grins on their faces. I explained that while I am pretty good, separating the dogs and working with Carlos one on one was just as important. Puppies love to play and often will ignore just about everything else when there is another puppy to play with. While I was teaching the dog the basics with Carlos, I went over some non verbal communication methods along with some tips to help with common puppy problems (Chewing, barking, jumping up, potty training, etc). Once all the members of the family had practiced leading Carlos through these exercises, I had them place him in his kennel so we could repeat the process with Aurora. She was slightly more challenging to teach, but only marginally so. After Aurora had mastered the basics, I worked with her on her kennel. She did not like going into it so her owners had gotten into the habit of picking her up and placing her inside at bedtime. I always want a dog to execute any movements on their own so I pulled out a few high value treats and waved them in front of her nose to get her attention. Once I had it, I led her over to the part of the room her kennel was positioned in. I stopped a few feet away and then slowly motioned the treat from in front of her nose to small toss inside the kennel. As soon as I tossed the treat in the kennel, Aurora hesitated for a second so I remained completely still. When she looked up at me, I turned my gaze to the kennel and waited for her to make the next move. After thinking about it for a minute, Aurora hesitantly walked over to the front of the kennel then cautiously entered it. I remained completely still and waited for her to come out before moving again. I tossed in another thigh value meat treat and waited again. This time Aurora went in much faster to I repeated the process until she went in without any hesitation. I suggested that her owners repeat this exercise and also leave treats and new toys inside when the dog is away and not looking. This way every time the dog goes into the kennel, something good happens. When we let both puppies out at the same time, they were considerably calmer, much easier to correct and easily following the commands they learned 30 minutes earlier. When I asked their owners what they thought, I got a one word reply, “Wow!” I love getting that response. By working with the puppies individually at times and practicing the basic commands, behavior and obedience, these dogs will learn the rules, boundaries and expectations that their family wants them to follow before they get a chance to develop any bad or unwanted habits. If only more of my clients dod the same!